Hands up crafters if you have a special box for card and paper scraps. Now keep your hand up if you’ve had to start a second box and subcategorise them into ‘large and small’ pieces. (No judgement here!) I also have a box of paper pads and there is one type of paper that always seems to be left behind-the scene papers. You know the ones, too pretty to use for layering as they have a design that needs to be seen, but how on earth do you turn them into a card if you can’t cover them? This card uses scraps and papers from the unloved and not sure what to do with box, a great way to use some stash. I read a magazine article about creating a background using watercolours and then die cutting from it, layering the die cut part with a contrasting colour. I thought it looked like an idea I could adopt for the scene papers, and had a go. Then I had another go so I could take photos for a tutorial! I think it looks really effective and is actually quite simple to achieve. 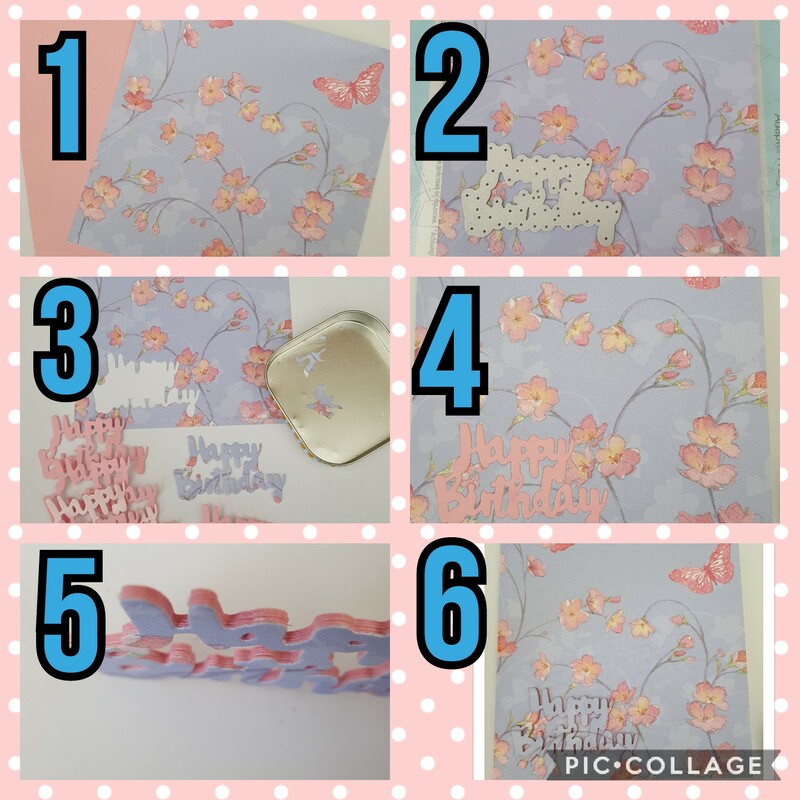 Choose a greeting die that isn’t too fancy as you will be sticking the waste pieces back into the gaps (hopefully my instructions will explain that better!) The one I chose is about as complicated as I would want to go, I think I’d have to really like someone to make one more fiddly than this for them! 2) Die cut the greeting from the main paper with a scene on. 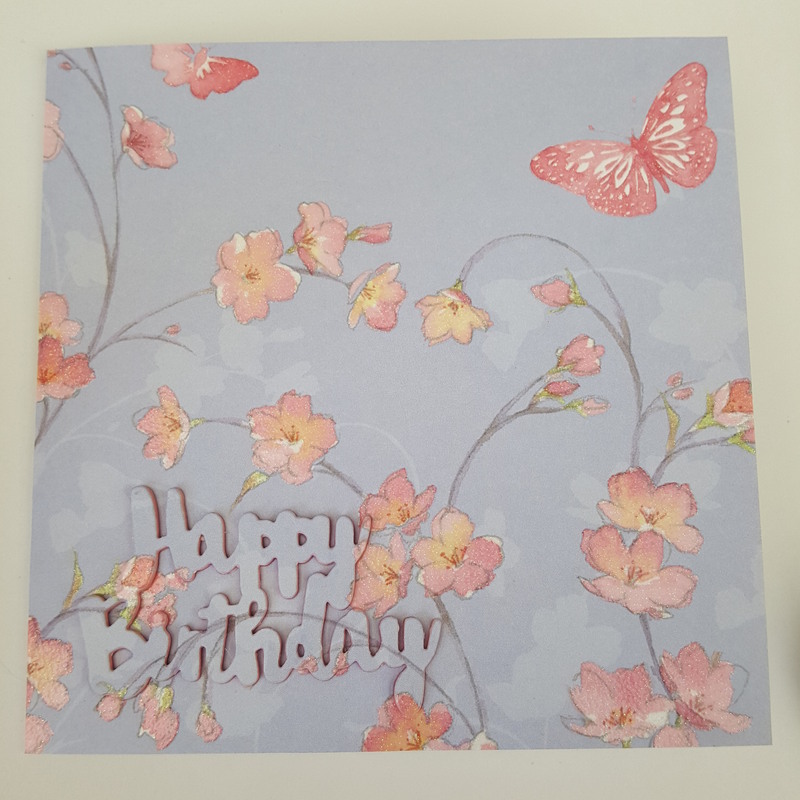 I chose to balance out the butterfly, which was the main feature and cut the greeting from the corner diagonally opposite it. Be really careful when removing this die cut as you need to keep every single piece (including the waste from the middle of the letters). Put the little pieces to one side where you won’t tip them over. 4) Place double sided tape around the edges of the main piece of card and across the aperture made by die cutting the greeting (this is where wide tape comes in handy!) Stick one of the contrasting coloured die cuts onto this now. Peel The backing off all of the tape and stick it to the base card. Now take the tiny pieces of waste from the die cutting (in my case, the purple ones) and pop them into the holes. The double sided tape will keep them in place nicely. If they are really fiddly, use a pin or a pokey tool to help you. I love the simple 3D effect and the whole card took less than 30 minutes even with me taking the photos. A super simple but pretty card all ready to go! Have you got any papers you could try this with? I think a ‘thank you’ greeting would work really well too, and of course with a Cricut the possibilities for text to cut out are endless! The best part is I did it all using things I already had hanging around. I hope this inspires you to try it, or at least look at your stash in a different way. Wow! That is such a cool way to do that! And it looks so professional. I don’t make cards, but I have been looking at my yarn stash with a critical eye lately. It wasn’t, but my niece was happy with it for her weaving loom! Ooh! I’ll bet. My aunt likes to weave with stiffer yarn as well. Thank you, I do like a nice simple card, fuss and frills just aren’t me! Thank you, I think the magazine made it look more fancy! Very organised! Thanks for the lovely comment, there’s a lot of things to be done with this technique I think. Really nice, MrsCraft. I like the 3d effect. I don’t make cards myself, but love looking at creations such as these. 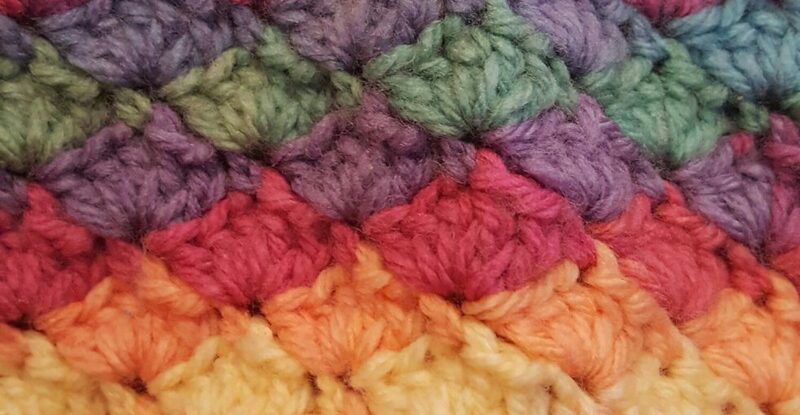 I watch Create and Craft TV (I think that’s the channel’s name – it’s what I call it anyhow!) every now and again, and could watch for hours when they’re cardmaking. Thank you, I never watch that channel but I was tempted to make my own video, then I decided I had nowhere to film it and I’d need a manicure and a makeover so I abandoned that plan! Thank you, I’ve found a few more to try it with too. Wow, that’s a really nice technique. It “looks” significantly embossed in the picture so amazing work! Thank you 😊 I do like a simple design sometimes.